The two main scenarios in which you will be setting up a computer in your home is if you are a new student returning home with a school computer from a live orientation with us or if you are an existing student and have just received a laptop replacement from us (which we typically ship to your home). Below are some important steps and information on setting up our technology hardware. Turn on your computer and connect it to your home Internet. If you have wifi in your home, you will need to enter your wireless password. 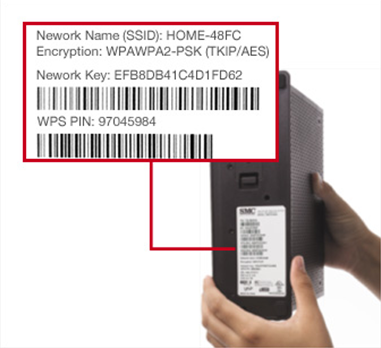 Your home wifi info is typically located on your Internet router (example shown here). After connecting to the Internet successfully, updates for the computer may start to install. This is normal. More on updates here https://support.palcs.org/hc/en-us/articles/360001614108. Ink for the printer will be in a cardboard box along with the usb printer cable. Connect your printer to your laptop with the provided USB cord. Conduct a test scan. Follow steps on this page: https://support.palcs.org/hc/en-us/articles/224343247. Please note: Wifi printing is not enabled. The ability to set up wireless (wifi) printing requires administrative access to our computers. If you wish to set up wireless printing, parents should submit a HelpDesk Ticket. A helpful article on resolving common issues with computer sound is found at https://support.palcs.org/hc/en-us/articles/360001625127.